The IRS is exceptionally powerful, and when you bump heads with the agency it can be a nerve-wracking situation. Few people can be confident of dealing effectively with the IRS themselves, so it’s wise to have experienced representation on your side. Legal representation is provided by tax attorneys, who can help you defend your rights and protect your assets. An IRS tax attorney is a qualified lawyer with extensive experience in tax law. He (or she) usually specializes in the rules that apply to tax liability at a federal, state, or municipal level. He is also qualified in the nuances of taxation as it applies to estate transfers, income from a wide range of sources, and multiple types of business transactions including intellectual property purchases. Most tax attorneys begin by studying for an undergraduate degree in any field from a recognized institution, but the most common routes to this position are business, economics, finance, or accountancy. Students then complete a three-year program at an accredited law school with a strong tax law program, after which they write the American Bar exam to become qualified tax attorneys. Many of these circumstances can be resolved satisfactorily if you have a legal representative who knows how the system works, and is able to identify a suitable defense for you. An offer in compromise: This is a multifaceted option that enables you to make a tax settlement for a lower amount than the taxes owed. The offer will usually only be accepted under specific circumstances, and our IRS tax lawyers know how to make these deals. Payment plans: With an experienced attorney representing you, it may be possible to get an IRS agreement for paying down your tax debt over a period of time. Abatement: Tax penalties can be harsh, but if you have a legitimate excuse for not filing or paying an IRS tax attorney will be able to help you prove your case and escape the penalties. Innocent spousal relief: An IRS tax attorney can help you avoid being liable for tax debt incurred by your spouse. Bankruptcy: If you declare bankruptcy under certain circumstances, your tax lawyer may be able to have your outstanding taxes discharged. Comprehensive advice covering various areas of tax law other service providers can’t cover. For example, a tax attorney can offer complex solutions on issues such as bankruptcy, while other tax professionals can’t. Acting on your behalf, including representing you during meetings and communications with the IRS. Negotiating the amounts owed to the IRS, both in and out of court. In addition, you have the advantage of quick access to someone with superior training and skills, who can steer you in the right direction and reduce the stress involved in these situations. Tax attorneys come in all shapes and sizes. Some are attached to larger legal firms, others to tax consulting companies. When you need to retain professional assistance to deal with the IRS, don’t be persuaded to appoint the first tax lawyer you come across. Conduct some online research to determine whether the person offering to represent you has the qualifications to do so, and to see what reviews other clients have left about their services. Reputable IRS tax lawyers are willing to provide references, and often come highly recommended by family or friends. At Top Tax Defenders, we have access to a number of dependable, experienced tax attorneys, enabling us to provide a full range of tax services to resolve your IRS problems fast. 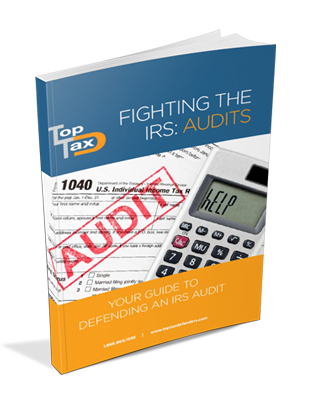 Received an IRS Audit? Learn everything you need to know about facing the IRS and winning.